Very nice. I remember the design of the sculptures from a while ago. Still, the robot is rather noisy and impractical. I think it would probably be better as a transporter for heavy stuff rather than a people carrier. It’s slower than actually walking, but it could save you from having to carry a bag of concrete or something out on the job. Welcome to the next dolly, but with no wheels. Yes, I see this as a rough terrain dolly with really impressive carrying capacity. 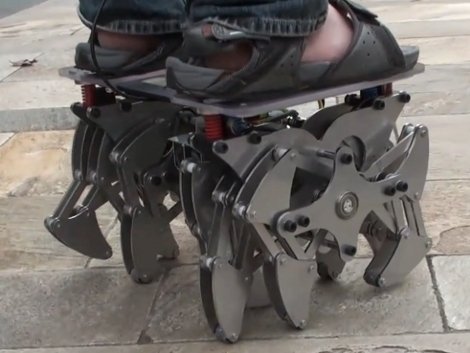 The high-stepping gait could deal with random terrain better than most designs I’ve seen. I think this thing could go most of the places an ATV can with a much smaller vehicle. i wouldn’t be wearing open toe shoes on this thing… or ever… because i am male. nice to see people adapting the work of Theo Jansen. …bringing it closer to practicality. he is absolutely brilliant, but i think quite mad. Make it bigger, make it a chair and fine-tune to walk up and down the stairs. I move pianos. Humm ? I think it can’t do stairs. If it goes over a stone all the pressure goes on that one foot, link, crank, ouch. Put soft rollers on the feet, back rubs anyone! Lets make a bicycle version. 4 ft long legs. It’ll be all the rage at collages! Disgusting. I don’t want to see your smelly feet. Put on some decent shoes, or at least some socks. Not everyone has them? ask a vet. this would make an awesome wheelchair alternative if scaled up. That was the first thing I thought when I saw it. wow that thing is noisy. Make it bigger and make it jump, then I’m impressed. But as of now, its a cool concept. such a cool little machine, it does sound kind-of scary though. the noise is terrifying, I want one. Good idea. I just don’t think it would last over a years time with that much load on it. Keep up the good work! For all you haters out there; this is a great idea in its beginning stages. Like others, I can see a heavy material transporter or an advanced mover for people that have lost the use of their legs (ie Veterans, para & quadraplegics). Does it need some work? Sure, but instead of tearing down somebody that put the time and effort to build the prototype, do something better! But of course not, you haters would rather play games on your computers. what does this do that wheeled transport cannot? but this seems to be literally a step backwards?